AncestorPuzzles.com: Celebrating Citizenship in a New Century with Nonnu. Celebrating Citizenship in a New Century with Nonnu. 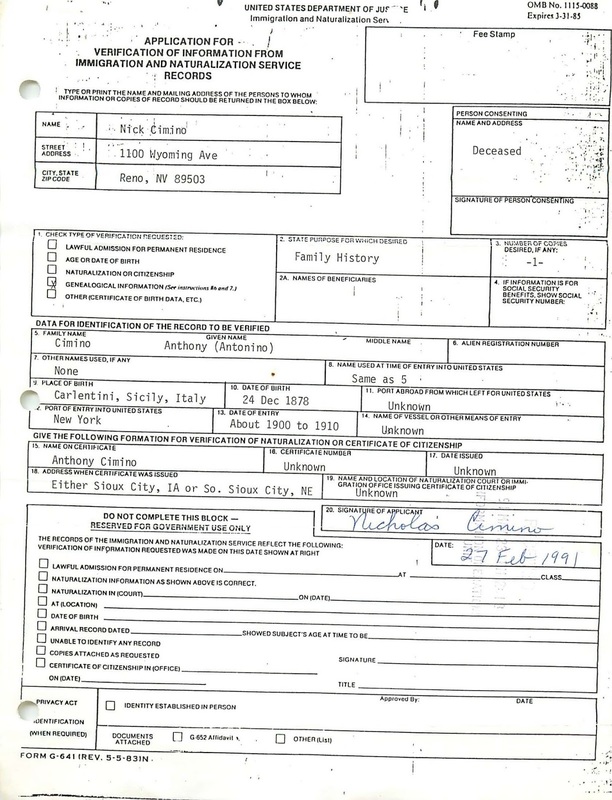 I began searching for Nonnu's citizenship papers in 1992, but finally found them in 2015. Nonnu is the Sicilian name for grandfather. 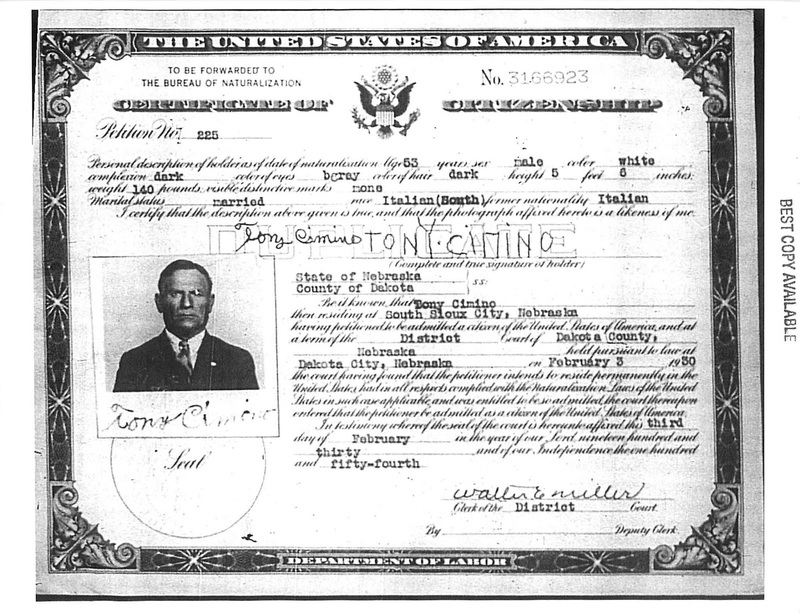 My great grandfather, Antonino Cimino is known as "Nonnu" by the extended Cimino clan. He was born in Carlentini in the Siracusa province of Sicily on December 24, 1878 according to the Carlentini birth records. 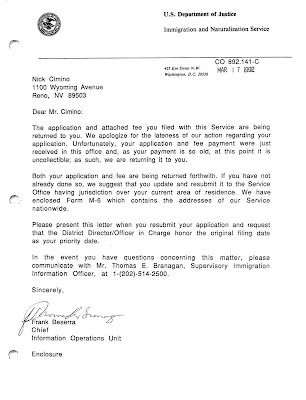 I had a very bad experience with the Immigration and Naturalization Service back in 1992. 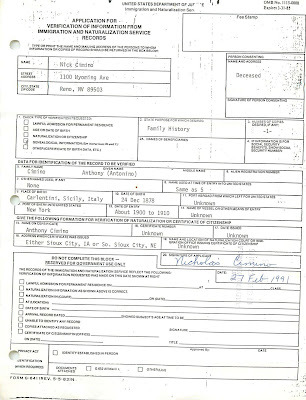 I signed the application in February 1991 and INS finally found my application and check over a year later. By that time the check was noncollectable. I was so disgusted with the process that it took me over twenty years to try again. All is forgiven now! I am just happy to finally have Nonnu's citizenship papers. 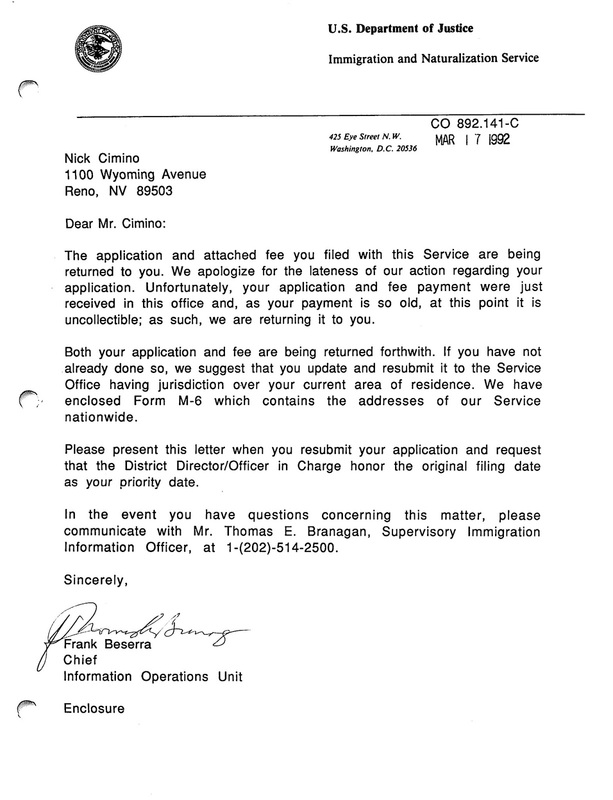 I recommend that you review the "facts" in naturalization papers with caution. 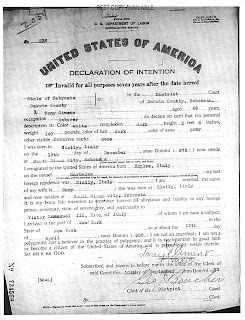 The following image of the Declaration of Intention has the wrong information for his date of birth and the name of the vessel. 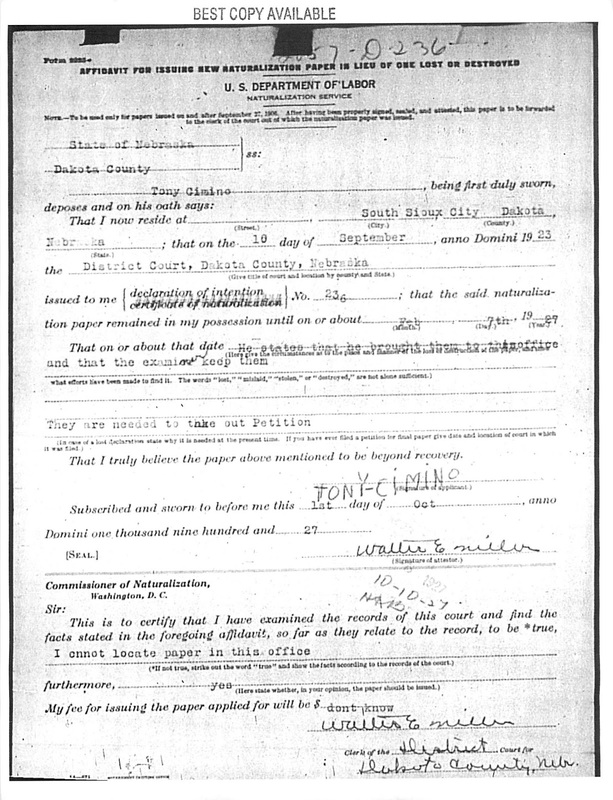 As stated earlier he was born on 24 December 1878 and this document says 15 December 1876. 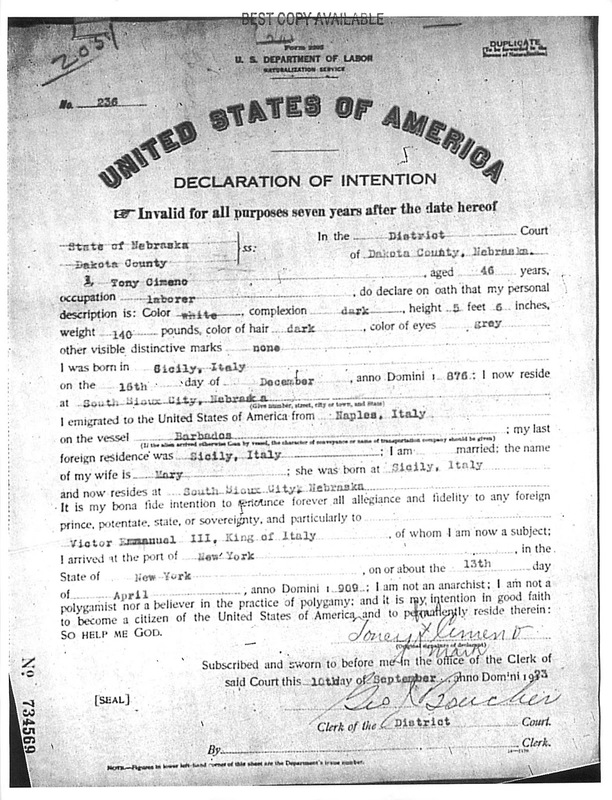 The Declaration of Intention says he emigrated to the U.S.A. from Naples, Italy on the vessel "Barbados." The actual vessel where his name appears on the passenger list is the S.S. Barbarossa. It is also notable that "Nonnu" AKA Tony Cimino signed the Declaration of Intention with an X in 1923. 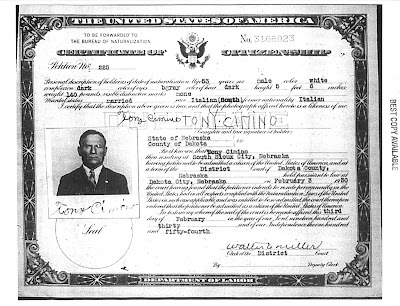 By the time he finally received his Certificate of Citizenship in 1930 he could sign his name. 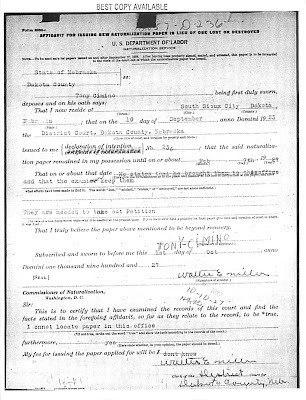 The first paper in the process was the Petition for Naturalization. This 1921 document is packed with information but it also has a few inaccuracies with the birth dates that are not obscured. These mistakes in the facts may be due to Nonnu's fuzzy memories or to a communication breakdown with the Dakota County court clerk in South Sioux City, Nebraska. Suffice it to say that further documentation is required to ascertain the "true facts." The Weekend is hosted by Huntsville Public Library & Walker County Genealogical Society. The Huntsville Public Library is a FamilySearch Affiliate Library. Pre-registration is encouraged, but not required. For more information go to www.myhuntsvillelibrary.com or contact: Mary Kokot, Adult Services Coordinator at 936-291-5471. Great post. I'm always fascinated about the immigration process. Unfortunately, my ancestors came over in the 1850s and the process wasn't as formalized. Thanks for the comment. I really enjoyed the opportunity to present at the conference that you organized (Houston Family Search Genealogy Conference at Summerwood Stake Center). Regarding the 1850 immigration, the best hope for that era is that your immigrant families traveled together. I have found that when immigrants traveled with another family member, it helps, to confirm their identity. Please encourage folks to come to my presentation in Huntsville on July 31st for more information on immigration research techniques.